Author: Kalla, Daniel Set In . . .
Ben Dafoe, a young emergency-room doctor and part-time crime-scene consultant for the Seattle Police Department, is haunted by addiction. Two years earlier, a cocaine and crystal-meth habit claimed the life of his identical twin, Aaron. Now Ben walks onto the scene of a savage stabbing to find that the victim is his former fiancée, Emily Kenmore—another loved one who fell prey to drugs. Part of the carnage in Emily's bedroom is a single streak of blood caked on the wall. 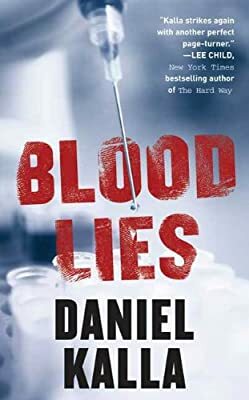 Set against the backdrop of the ER, Blood Lies is a medical thriller and a Fugitive-style suspense novel with a major twist. As Ben struggles to solve a tragic mystery from his past and clear his name, he might just learn that, sometimes, blood lies. . . .